It’s takes a village to raise a child. It takes a child with autism to raise the consciousness of the village. On November 22, 2004, Holly Lynn Connor was born in Seattle, Washington with no complications. From day one, we noticed Holly never seemed to look at us and cried nonstop. We were assured by the pediatrician that her eyes were simply developing at a slower rate and not to worry. By four months Holly showed no improvement and was diagnosed with Septo Optic Dysplasia (“SOD”) and Panhypopituitarism (“Hypopit”). A person with SOD has optic nerves that are small and poorly developed. Instead of having over 1 million nerve fibers from each eye to the brain, there are far fewer connections. Holly is rare in that she was affected in both eyes and could see little to nothing at birth. When Holly was diagnosed, there were minimal online resources and support groups. I felt alone in the world with no answers. To date, there are still no explanations as to what causes SOD. wear shoes or any clothing below the knees or elbows. And she cried pretty much nonstop. When she was four-years-old, we took her to China for seven weeks to receive stem cell treatments. The effect was miraculous. While the treatment was geared towards her vision, we saw a nearly 50% improvement in her autism almost immediately. Roughly two years later, her vision improvements also became apparent. Her vision increased from an inch or two to seeing contrast and movement up to 10 feet away. Due to Holly’s successful treatment in China, we booked another round of stem cell treatment when she was twelve. This time it was to Panama. The trip to Panama was slightly more abbreviated at only 7 days. Since that visit, she has seen additional autism reductions. In addition, her vision, while still being blind, picks up contrast and movement up to 30 feet. Two clear-cut examples of autism reduction are the reduction in Holly’s anxiety levels and the willingness to expand her diet. Pre-Panama her anxiety levels were nearly debilitating at times. As is common with most kids with autism, Holly would only eat about 5 things prior to Panama. Though she always objects at least once to a new food, now she eats nearly everything we give her. What makes Holly so unique and special is her musical talent, something we discovered at a very young age. When she was only a month old we played a Winnie The Pooh tape and she immediately stopped crying. After that, our house was filled with music 24 hours a day. It seemed to be the only thing that calmed her. When Holly was 6 months old, she began playing the piano keys with her hands and her feet. At age 1, she could count to 100, sing the alphabet backwards, and play simple notes on the piano. It was at this point where we realized she has instant memory. By Age 2, Holly could play any song by ear on the piano. At 3, we discovered she had perfect pitch, vibrato, and she could tell identify keys of songs on the radio. When she was 4 we started piano lessons with a teacher specifically trained for kids with Autism. By age 7, she could recognize and play complex chords on the piano. Holly also memorized and played songs on the piano after hearing them just once. When she was 8, Holly picked up the harmonica and recorder. This was also around the time she started being ok in public. So we attended live theater and kids’ performances every weekend. Holly joined her first choir at her elementary school when she was 9 years old. She also began working with a vocal coach and attended her first vocal/piano classes. The facility worked specifically with kids with disabilities and paired them with typical kids. This year marked her first performance at a summer camp in which they highlighted her singing. The seed was planted for enrolling Holly in musical theater. When Holly was 10, she had her first piano recital and first vocal competition. She sang opera and musical theater pieces and took 1st place for her age group. Shortly after, we moved to St. Louis for my husband’s job. Holly started playing the cello in the school’s 5th-grade orchestra program and joined her first formal choir (STL Children’s Choirs). She also was in her first musical, Space Pirates. Being a new endeavor for everyone involved, she did her scenes sitting in a chair.. The following year, age 11, Holly started taking voice and musical theater classes. She was also cast in her second ever show, Seussical. This time she was doing limited choreography and even had a speaking line. At age 12, Holly was cast in 8 consecutive shows with 3 named roles. The roles included Glinda in Wizard of Oz, Fairy Godmother in Cinderella, and Mama Ogre in Shrek. We also started her in ballet lessons. and Cinderella’s Mother in Into the Woods. wrote her first original song. That brings us to the present. At age 14, Holly is immersed in the arts 7 days a week when not in school. She is in 3 choirs, 2 jazz bands, acting and dance classes, private lessons for acting, ballet, tap, and piano. Holly works out every morning on her spin bike. In addition, she also trains weekly with a personal trainer to help with low muscle tone. She is part of a tandem biking club half the year. At any given time she is in 2-3 musical theatre productions. Right now, she’s excited to be playing Medda Larkin in Newsies and Madame Aubert in Titanic. The last few years of Holly’s development have been life-changing for Holly and for those around her. St. Louis musical theater community has been extremely accepting and inclusive. The directors have all been accommodating and understanding of both her visual and autistic needs. More than that though, the kids she performs with are more accepting than I could have ever imagined. They are always looking out for her and we never worry about her being in a safe space. Now that she is fully immersed in the arts community in St. Louis and working with such a large number of kids, Holly seems to have friends everywhere she goes. For the first time ever, Holly found a best friend who’s become a huge part of her life. They talk every day, eat lunch together at school, and are in choirs and musicals together regularly. Her friend, Abby, has an effect on Holly which is hard to quantify. Through her friendship with Abby, Holly is learning more of what it means to be a typical teenager. She’s learning how to interact with others on a social level, and how to have empathy. Empathy is very difficult for someone with autism. Holly is extraordinarily talented and we continuously keep her engaged with the world around her. Remaining involved in musical endeavors will position her for a greater opportunity for future success in life. Through the many ways she interacts with the world, Holly continues to influence and change how people see her. Hopefully, this will translate into how they see, interact with, and accept people with all abilities. 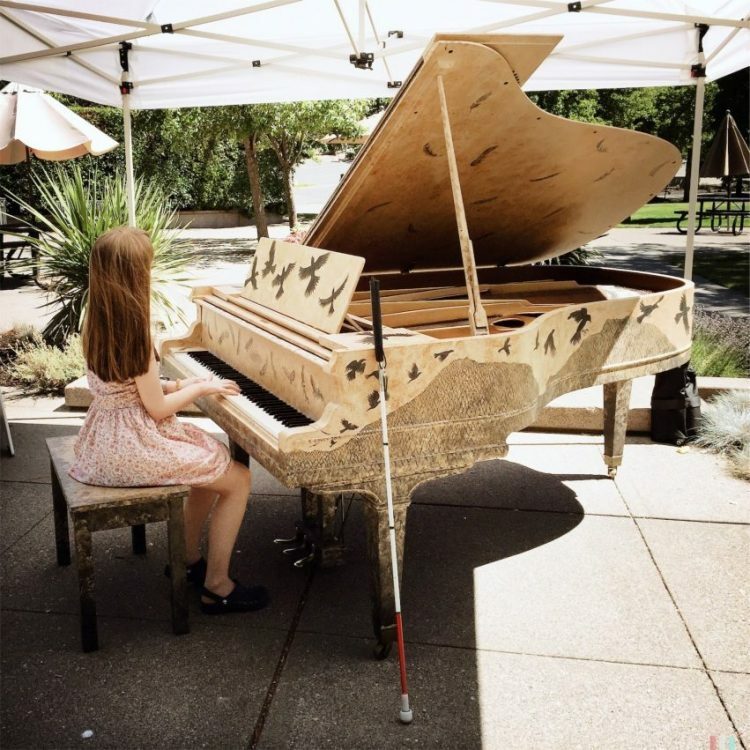 In the featured photo Holly is outside under a white event tent playing a baby grand piano. She is wearing a light print dress and her long hair is draped down her back. Her white cane is propped up in front of the piano. Professional headshot of Holly with long wavy red hair framing her pretty face. She is wearing an emerald green top. Black & white photo of Holly as a toddler sitting on a piano bench with her hands and feet on the piano keys. In this photo, little Holly is standing in front of the piano with her arms reaching up to play the keys. She is wearing a tan jumper paired with a white polo shirt and red (with white trim) Mary Jane shoes. Her blond hair is in pigtails. A photo grid with two photos. The first one is of a theatrical performance with Holly and a number of her peers in costume on stage. Holly and two characters on either side of her are wearing southern belle type gowns. In the second photo, Holly is singing solo holding a microphone. Outdoor photo of Holly casually dressed in a black jacket, jeans, and a white graphic tee. Her hair is pulled back and she has bangs and is also wearing sunglasses. This photo grid also contains two photos. In the first one, Holly and four friends are standing while posing for the camera. All five girls dressed for dance practice with black leotards and loose tops. Holly is in the center. The second photo is Holly with her best friend Abby. They are sitting on a pile of gym mats and Abby has her left arm around Holly’s shoulder.